Ven. 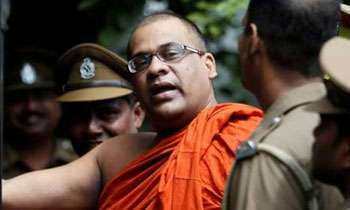 Galagoda Aththe Gnanasara Thera, who was admitted to Sri Jayewardenepura General Hospital (SJGH) following a complication in the area where a surgery was done, has been transferred back to the Welikada Prison Hospital, SJGH Director Dr. Susitha Senaratne said. “The Thera was fit to transfer back to the Welikada Prison Hospital. I do not wish to disclose more details of his condition as it was not ethical to reveal such details to the media” the director said. The Thera, who was serving a 6-year prison sentence, was transferred to the Prisons Hospital on August 30 after undergoing surgery at the Sri Jayewardenepura General Hospital. However, the Thera was again transferred to the SJGH on September 06 due to an allergic reaction. I can’t believe the doctors made the right decision on this occasion sooner. What’s happening? Sri Lanka is going to be a heaven again?! Karma will always catchup with these fake free loading monks! This is a circus. Where is the jumper? Why Why Why? How many days actually did he really spend in a prison cell? Do all inmates have luxury of getting their medical done after being imprisoned? Hope the venerable gets better soon so that he can stay in his prison cell. NO NO NAANA SAARA THERA VATHAAWATH KIREEMATA PRISON HOSPITALAYATA VADAMA VOOVAA... SAAAAADU. Let's hope there is no more conniving with criminals by GMOA doctors, not only to give this man who is a disgrace to Buddhism a place at the SJGH, but also to keep him for 6 years in a hospital bed n the prison. He needs to live like any ordinary prisoner. Maybe he'll then come to his senses then. Investigative journalism please - what nis wrong with this thug - right of information - as taxpayers money is getting wasted. He should be given all the privileges and perks as given for a sick convict as permitted by the law on par with common convict. This would be a prelude to new comers as well, perhaps soon; either in current or past governments. Hope the jump suit fits him. Disgrace to Buddhism and a coward who is unable to face punishment for his thuggery and criminalist.